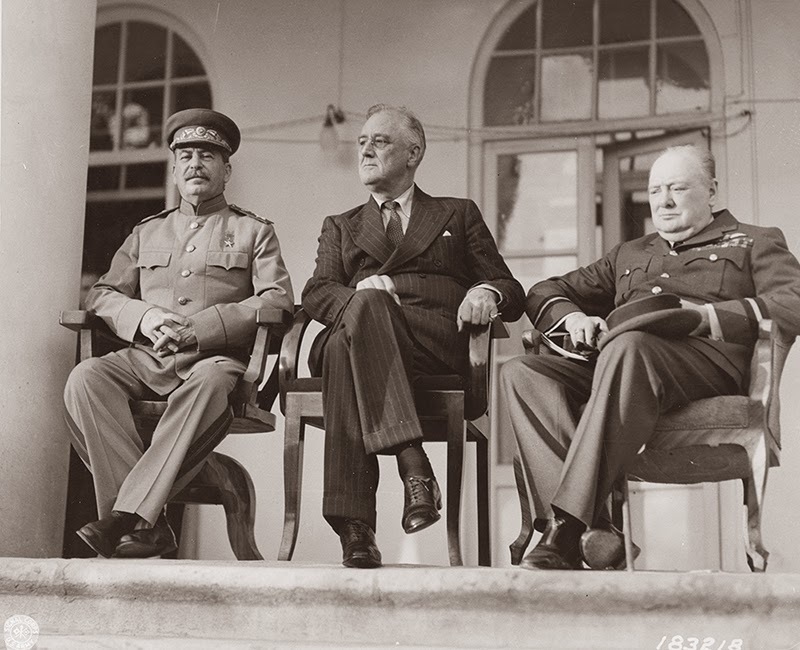 “On this day in 1943, President Franklin D. Roosevelt joined British Prime Minister Winston Churchill and Soviet leader Josef Stalin at a conference in Tehran that cemented the pledge of an Allied second front against Nazi Germany in Western Europe. The leaders, known as the Big Three, chose the Iranian capital as the site for their parley, largely at Stalin’s behest. When first lady Eleanor Roosevelt and Roosevelt’s daughter Anna voiced a desire to accompany the president, he said no women would be present. Subsequently, they were incensed to learn that Churchill’s wife, Clementine, and Madame Chiang Kai-shek of China had made the trip. FDR biographer Doris Kearns Goodwin wrote that rather than feeling any trepidation about the dangers of a secret trip through war zones, Roosevelt was not only eager to meet again with his friend Churchill but also excited at the prospect of meeting Stalin for the first time. Roosevelt promised Stalin that the Americans and the British would invade Nazi-occupied France, crossing the English Channel, in the spring of 1944. Until that point, Churchill favored a joint strike through the Mediterranean, pushing eastward through the Balkans. That strategy would have presumably secured British interests in the Middle East and India while curbing the Soviet advance into Eastern Europe. For his part, FDR, with the advent of an Allied victory, sought to break up the British Empire; his concessions to Stalin served that goal….